You would have noticed how tempted you get when you enter a supermarket and see a huge collection of moisturizers piled up on racks. You feel like constantly trying different brands and smelling different each time! 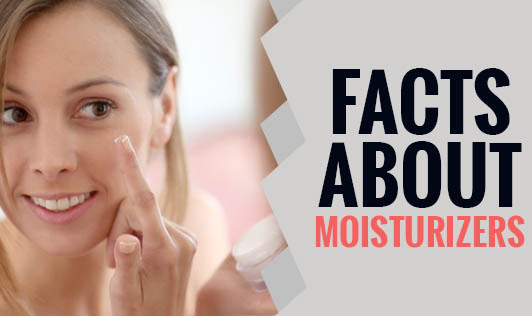 Here are a few facts you should know about moisturizers. Wrinkles: Once you find the right product for your skin, moisturizing every day can help avoid skin dryness and wrinkles to some extent. Wrinkles begin deeper in the skin due to collagen loss and is a natural process of aging. No moisturizer can completely eliminate it. A wrinkle needs a wrinkle tackle cream that can help you. Though it cannot reduce wrinkles, it will surely help you look younger by slowing down the process. 1. Artificial colorings: Moisturizing products that contain artificial colorings pose harmful effects to the body. Many are suspected of causing cancer. Aside from being carcinogenic, some coal tar colored moisturizers also contain metal impurities such as lead and arsenic. 2. Petroleum: Is a petroleum derivative that clogs the skin from taking in oxygen and releasing toxins. 3. Synthetic fragrances: Can contain hundreds of chemicals, usually only identify themselves as "fragrance". Synthetic fragrances cause headaches, dizziness, rashes, and skin irritations. Many experts recommend the use of fragrance-free moisturizers to avoid allergies and irritation. 4. Formaldehyde: Widely used in cosmetics as a germicide, preservative and fungicide, formaldehyde is not listed as an ingredient in most moisturizers. It's suspected to be a powerful carcinogenic. Experts also recommend using all-natural moisturizers. Most moisturizers have just one simple function of providing a coating to the skin to seal in moisture so your skin dries out less. Whichever moisturizer you choose, it is recommended to be applied on damp skin. While applying, wetting your skin and then applying it can make it stick on for a longer time. Choose the right one for your skin!